The Invitation Letter presents the Courses for the Feast. Plenty of Food for Thought, with some Bones Included (styli and writing tablets, for example). 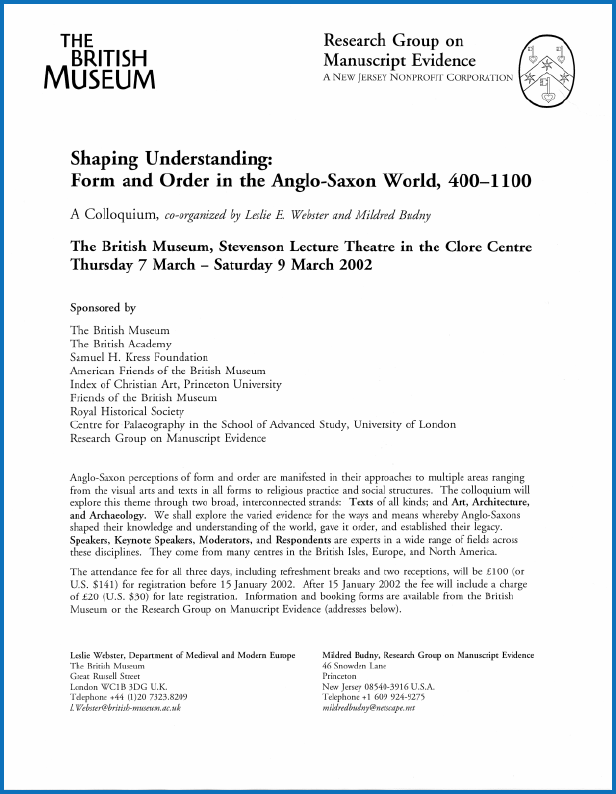 Leslie Webster has agreed to talk about the material evidence in the British Museum collection. Kevin Leahy will describe his finds at Flixborough from this point of view. Vivien Law will discuss the Latin material. 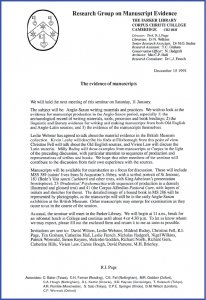 Milly Budny will show examples from manuscripts at Corpus in the light of the preceding discussion and with particular attention to sequences of production and representations of scribes and books. As usual, “we hope that other members of the seminar will contribute to the discussion from their own experience with the sources’. 41 (the Corpus Alfredian Pastoral Care, with layers of initials and sketches for them. 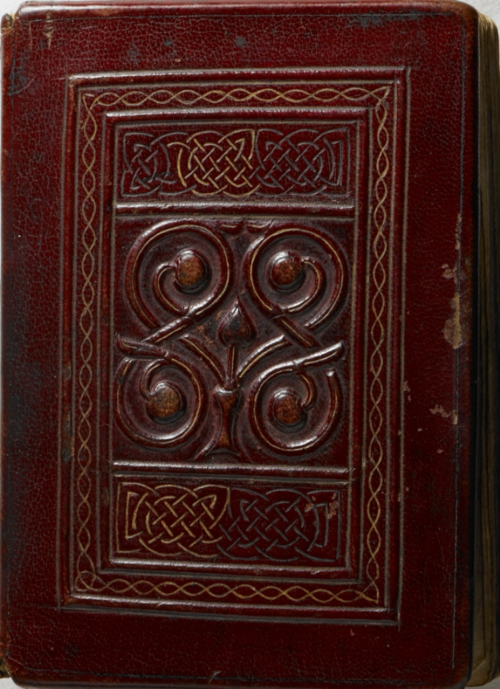 The detailed image of a bound book in MS 286 will be represented by photographs, as the manuscript will still be in the early Anglo-Saxon exhibition at the British Museum. As usual, “other manuscripts may emerge for examination as they occur to us in the course of the session”. As usual, the seminar will meet in the Parker Library. 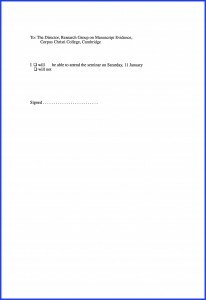 We will begin at 11 a.m., break for an informal lunch in College and continue until about 4 or 4:30 p.m. To let us know whom we may expect, please fill out the enclosed form and return it to me as soon as possible. David Wilson, Leslie Webster, Mildred Budny, Christine Fell, R.I. 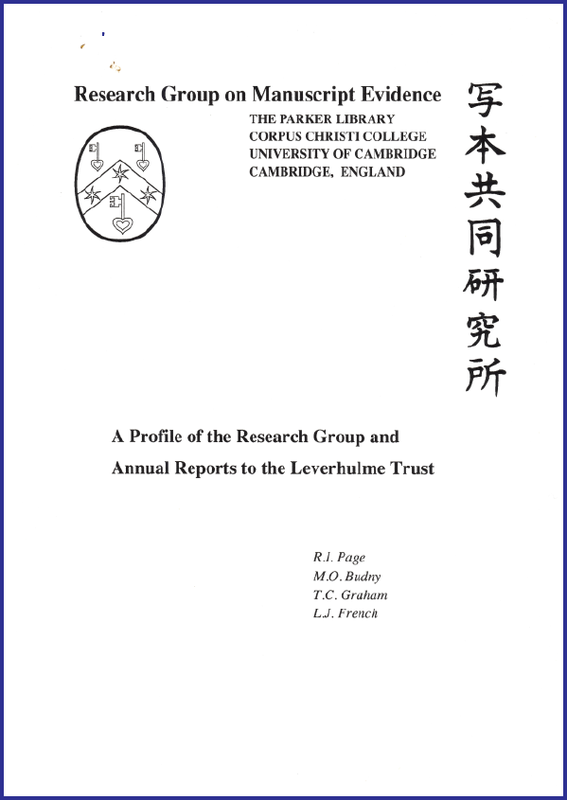 Page, Tim Graham, Catherine Hall, Leslie French, Nicholas Hadgraft, Nigel Wilkins, Patrick Wormald, Simon Keynes, Malcolm Godden, Richard North, Richard Gem, Catherine Hills, Vivien Law, Carole Hough, David Parsons, M.H. Brierley. David Wilson, Leslie Webster, Mildred Budny, Christine Fell, R.I. Page, Tim Graham, Catherine Hall, Nicholas Hadgraft, Patrick Wormald, Simon Keynes, Richard North, Catherine Hills, Carole Hough, David Parsons, M.H. Brierley. The Archives contain the 2-page handwritten card from Vivien Law explaining that she could not, after travels, attend and speak at the Seminar. They also contain detailed handwritten notes, made on the day, summarising the several expert presentations and citing the relevant elements in the manuscripts selected for display and discussion. The Brandon Plaque. ©Trustees of the British Museum. Other materials under consideration at the Seminar remained in-situ in their own locations — that is, in their current collections, for those forms of evidence retrieved archaeologically from the in-situ locations in the earth where earlier ages had relegated them, one way or another. Such a case is the inscribed lead plaque from the excavations at Flixborough in North Lincolnshire, as reported at the Seminar. It is depicted and described here, after a later discovery of the astonishing Staffordshire Hoard, in 2009, gave much cause for study, report, and publication freely online. Such a case is the little gold Brandon Plaque found on the riverbank at Brandon in Suffolk in 1978 and now in the British Museum. Measuring only 34 mm × 34 mm, the plaque is incised, inscribed, and decorated in black with niello. More about it below. 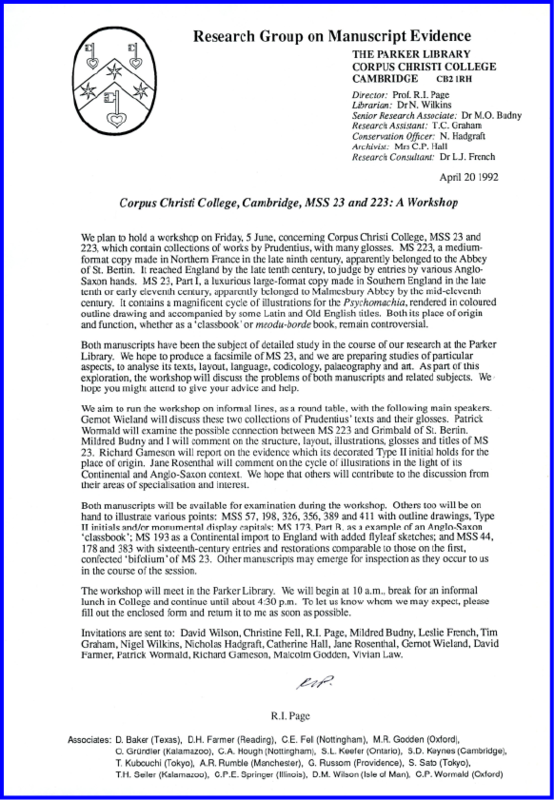 Strictly speaking, as we remembered at the Seminar, archaeological finds can include manuscripts. 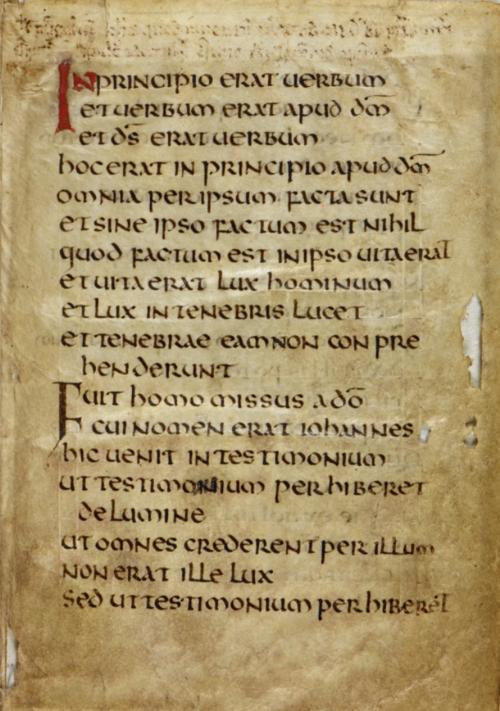 Such is the case of the renowned Gospel of Saint Cuthbert, formerly in the collection of Stonyhurst College in Lancashire, next on extended loan to the British Museum and then to the British Library (after the formation of that entity), and now part of the British Library’s collections as Additional MS 89000. 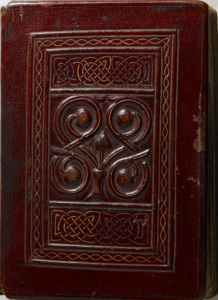 That pocket-sized copy of the John Gospel remarkably retains its original binding of red leather over wooden boards, decorated with interlace, geometric, and vegetal ornament. The text is written in an expert version of English Uncial characteristic of the double monasteries of Wearmouth and Jarrow. A lovely volume to hold in the hand, to turn the pages, and to admire, as I remember well from studying it in the Manuscripts Room, with indirect natural light (such a bonus), in the former building of the British Library, and both before after the formation of that entity, while the Manuscripts still remained within the British Museum. © The British Library Board. Additional MS 89000, front cover. © The British Library Board. Additional MS 89000, back cover. 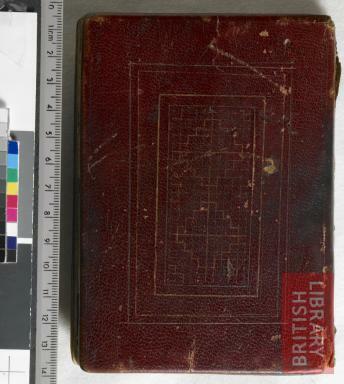 This well-travelled book was placed in the incised wooden coffin of Saint Cuthbert (who died on 20 March 687 CE). For centuries it lay shrouded there, apart from several exposures to the light with ritualised openings in various centuries of the set of coffins, with the oldest, wooden one the innermost. The wanderings of the relics from Lindisfarne (seat of Cuthbert’s bishopric), around and about, via Chester-le-Street, to Durham Cathedral, where they now repose in state are well-recorded, almost epic. Thomas Julian Brown, et al., The Stonyhurst Gospel of Saint John (1969). © The British Library Board. Additional MS 89000, folio 1 recto. James Raine, Saint Cuthbert: With an Account of the State in Which His Remains were Found upon the Opening of His Tomb in Durham Cathedral, in the Year MDCCCXXVII (1828) and now available via GoogleBooks, although I still prefer the book version on my shelves. C.F. Battiscombe, ed., The Coffin of Saint Cuthbert: Studies by Various Authors (1956). 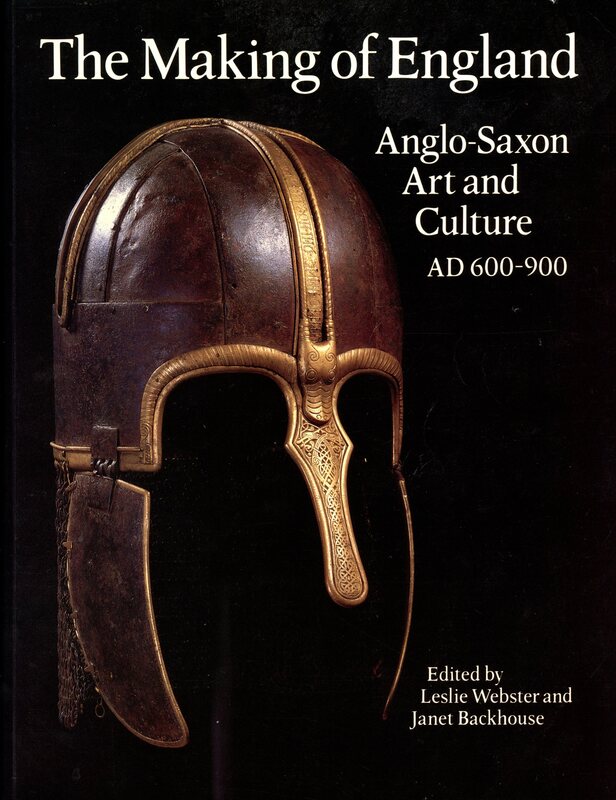 This monumental publication presents a weighty volume (more than 3″ thick) worthy to represent an extraordinary subject, comprising a complex ensemble of grave-goods worthy of a major Anglo-Saxon saint. I purchased my copy of the book on a visit to Durham Cathedral in the mid-1970s. Good thing that I was driving from London, as part of extended study trips. That copy has travelled by car around the British Isles on the way back to London, then by car later in a move to Cambridge, and afterward by ocean voyage to Princeton. A treasured souvenir as well as a continuing source of instruction. 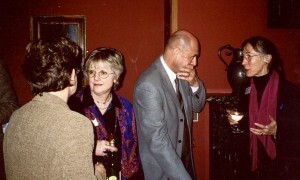 Following the Seminar, Mildred Budny reported some of its results, along with related research, in a series of lectures in the United States in February and May 1992. 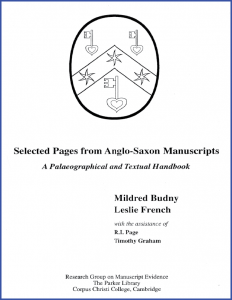 They expanded and updated the survey presented in her paper on “Anglo-Saxon Authors and Texts” at the 1990 International Congress on Medieval Studies; its Abstract appears in the Old English Newsletter, 23:2 (Spring 1990), C–19, now online. Already then, we had submitted the proposal for a major Research Project on “The Archaeology of Anglo-Saxon Manuscripts”, which, having been accepted for funding for 5 years by the Leverholme Trust, was set to begin later that year. 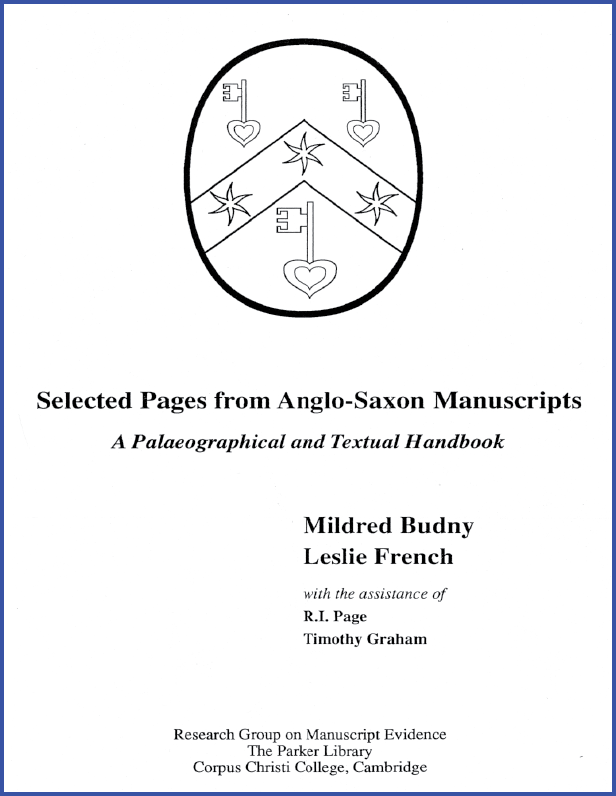 The Illustrated Catalogue of Insular, Anglo-Saxon, and Early Anglo-Norman Manuscript Art at Corpus Christi College, Cambridge (1997) includes all these manuscripts. These are manuscripts that I have examined long and often, and which remain vivid in my mind’s eye and within the grasp of recollection of my finger tips. 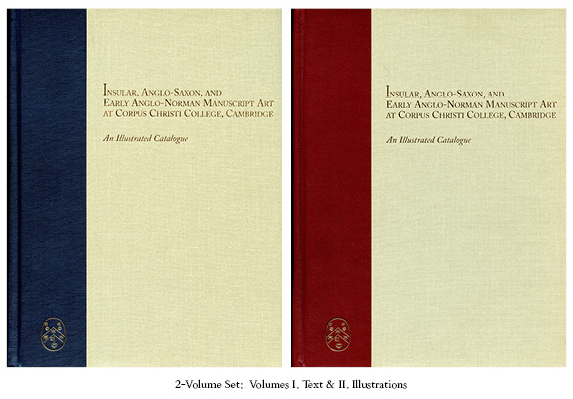 The Illustrated Catalogue is available from the Research Group on Manuscript Evidence, co-publisher of the 2-volume set, now with a special Promotional Offer. You might wish to have your very own copy. It might be easy to arrange. Details here. 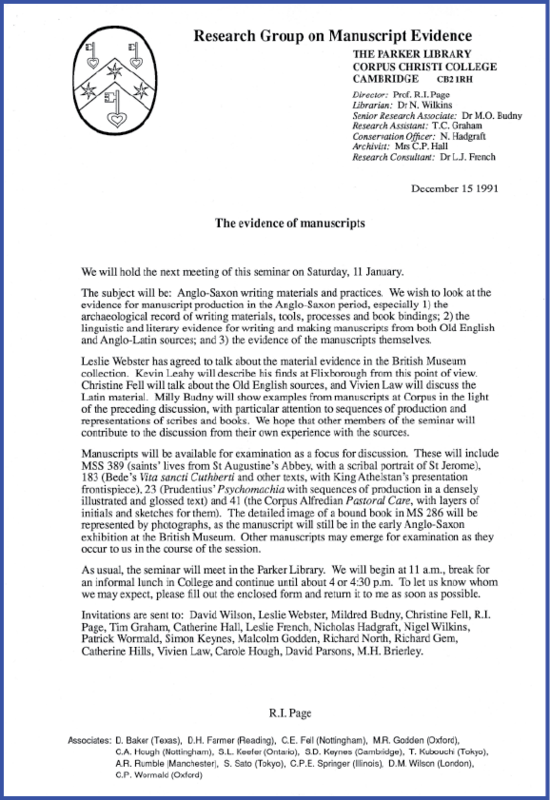 Later on, after the Research Project on “The Archaeology of Anglo-Saxon Manuscripts” (1980–1994) had been completed, the Research Group on Manuscript Evidence relocated to the United States, and regrouped after an unexpected change in the relocation address, there commenced — after a series of Annual Symposia on “The Transmission of the Bible” (1995–2000) — a “New Series” of Seminars, Workshops, Colloquia, and Symposia (2001–), leading soon to the 2002 British Museum Colloquium. Organised by Leslie E. Webster and Mildred Budny, this 3-day Program included papers on subjects including archaeology and manuscript studies. At the Research Group’s 2002 British Museum Colloquium, co-organised by Leslie E. Webster and Mildred Budny. Compiled, edited, designed, and laid out by the Research Group, its Booklet with the Abstracts of Papers can be downloaded here. This Booklet was the first in the a “New Series” organised by the Research Group on Manuscript Evidence to receive a multiple-page Program Booklet (issued at the Event itself) after the “Preliminary Report” (issued after the Event) for the Workshop on “Image-Processing and Manuscript Studies” (15 January 1994) in the “First Series” of Seminars on “The Evidence of Manuscripts”, which the First Seminar on “Manuscript Illustrations as Evidence for Anglo-Saxon Life” and the Seminar on “Anglo-Saxon Writing Materials and Practices” (You are Here) helped to generate. Let us revisit the little Brandon Plaque. I think that it is charming, and it continues to speak to me. Would you like to join the conversation? Reflections after the passage of time, in time for this webpost, and expressly for it, make their presence felt. Now, engaging in easy time-travel (as seen here), we resume the recollections of the Seminar, while reporting on its activities, and reflect upon some of their aspects, as studies of the materials, discoveries of more of them, and the sheer beauty of remembering direct Encounters with the objects themselves. It may be natural to reminisce when I have had the chance, impelled by the desire, determination, and perseverance, to look at the Originals whenever possible. Its image represents the half-length figure of the part-man, part-eagle Evangelist Symbol of John, in hybrid zoo-anthropomorphic form. The Latin inscription identifies him as Saint John the Evangelist, as its angular Monumental Capitals crowd into the available spaces around the figure. 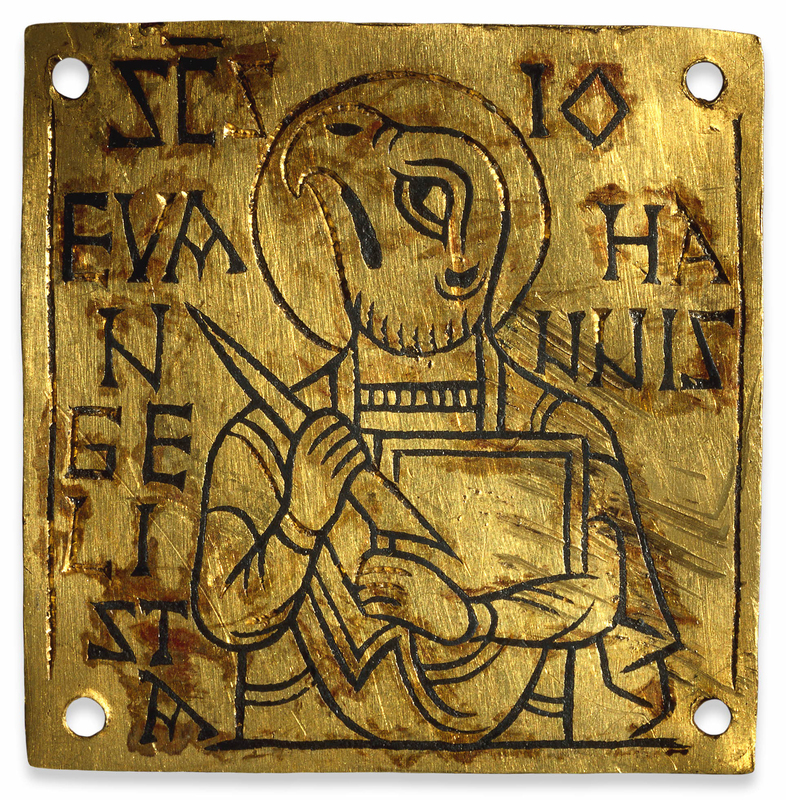 The style of the script and decoration locates the plaque within a 9th-century centre probably in Southern England. Wearing raiment (a step up, and then some, from “mere” garments), the man’s upper half appears in frontal pose, with broad shoulders, and holds a sharpened quill diagonally in front of his chest. Its nib aims toward the surface of a rimmed, blank tablet — or closed book? — tucked upright in the crook of his left arm. His raiment (a step up from “mere” garments) has band-like edges, including close-fitting sleeves with banded cuffs. His tunic has a pearled or beaded neckline. His haloed head takes an eagle’s form. Turned in profile, he looks upward to the left with closed beak and firm, fierce gaze. Ever since I could first examine, hold, and photograph this plaque, removed from display for study, it has been one of my favourites among images and objects which depict scribal creatures — especially those which celebrate the implements and attributes of the processes of the written word. The Brandon Plaque. 9th-century Anglo-Saxon gold and niello. ©Trustees of the British Museum. Although the plaque is separated from its former box or — might we dare to dream, original book cover of some superb Gospel manuscript — it perhaps formed part of a full set of figures or Symbols of the 4 canonical Evangelists. Because the order of these Evangelists’ Gospels can vary in surviving Gospel Books from the early medieval British Isles, it might be fitting for us to refrain from conjecturing that the full set would have necessarily followed the order of Matthew — Mark — Luke — John. Some of those books are covered, or remain to be covered, digitally for the Insular Gospels website. The principal study of their “architecture” in terms of structure of their contents remains Patrick McGurk, Latin Gospel Books from A.D. 400 to A.D. 800 (1961). A characteristically thoughtful study of the 4 Evangelists grouped as a set for such books casts light on the subject: Jennifer O’Reilly, “Patristic and Insular Traditions of the Evangelists: Exegesis and Iconography of the Four-Symbols Page”. 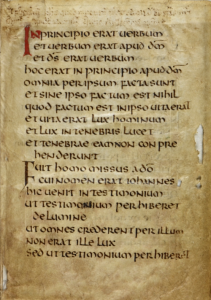 Even so, it must be remembered that the Gospel of John held a special place in some circles or spheres in Anglo-Saxon England. I learned this situation well from the firm observations by one of my teachers, the late Thomas Julian Brown (1923–1987), during the long years of my post-graduate work on the Ph.D. dissertation (University of London, 1985) devoted to a complex 9th-century Bible manuscript (this one). Julian would repeat, forcefully, that it could be no mistake that this pocket Gospel Book found its way into Saint Cuthbert‘s coffin — and perhaps (now I paraphrase) into his heart (perhaps I mean both Cuthbert’s and Julian’s) — because of the special spiritual characteristics of John’s Gospel, and a correspondence, even resonance, with the inscribed designs on the 7th-century wooden “Coffin-Reliquary”, which include the 4 winged evangelist symbols on the lid, and which, in no small measure may offer a form of mystical, apotropaic protection for the precious contents of its walls. Reliquary Pectoral-Cross included. 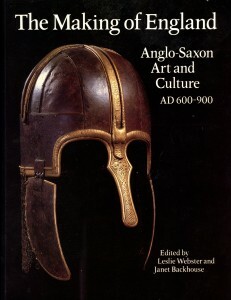 On this subject, Julian would regularly commend the study by Ernst Kitzinger on “The Coffin Reliquary” (pages 202–304) of in the collaborative volume of 1956 on Cuthbert’s relics edited by Battiscombe (cited above). And so also do I commend it to you. Not least because apotropaic objects and intentions can be fascinating. It can be inspiring to walk in the company of expert guides when looking at treasures from the past. Combining approaches, interests, and expertise in archaeology and many other fields can be endlessly instructive. Joining the quest can be fun, too. Don’t you agree?